Duo Striplash Adhesive is the world's best-selling eyelash glue and is a firm favourite of professio..
Grimas's Continuous Strip Eyelashes are black and come in a single length which can be cut to the re..
For dramatic false eyelashes, these thick black strip lashes from Grimas are perfect. To attach eyel.. Created by Grimas, these are dramatic and bold false eyelashes made from gold foil. Only for the mos.. Created by Grimas, these are dramatic and bold false eyelashes made from silver foil. Only for the m.. These black strip lashes from Grimas come with hints of silver foil in between the lashes, giving a ..
Made by Grimas, these light brown false eyelashes would be an elegant addition for a deer/fawn costu..
Lime Green and Bright Yellow, these Grimas false eyelashes are perfect for stage performances! 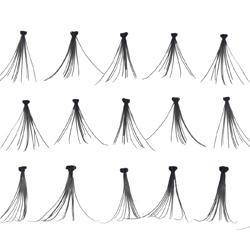 To at..
Made by Grimas, these are thin, purple false eyelashes, ideal for costume make-up. To attach eyelash.. These bold statement false lashes are made by Grimas, and have a gradiant effect; with black lashes .. 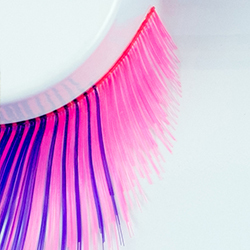 Hot Pink and Purple false eyelashes, these are the perfect lashes for an over-the-top stage look! To..
Made by Grimas, these are large, bright pink false eyelashes. To attach eyelashes, first check the l.. These Blood Red and Black false eyelashes from Grimas are perfect for a dark Halloween costume. To a..
Glossy black false eyelashes with strips of glitter in between, giving a futuristic look. To attach .. These false eyelashes from Grimas have a very art deco feel, with tapered black and white glossy las.. These candy coloured false lashes would be great for a clown costume or children's parties! To attac..
Made from high quality purple and gold glossy material, these Grimas false eyelashes would be a grea.. 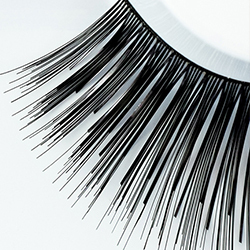 These black false eyelashes from Grimas feature a latticed patten, making for an elegant, subtle loo.. Subtle yet bold false lashes from Grimas, featuring a dramatic sweep effect on the outer corners of .. Featuring lashes that become more prominent towards the outer eye, these false lashes from Grimas ar.. These thick black eyelashes from Grimas feature small jewels scattered across the lashes, giving a g.. These feathery false lashes feature hints of green and purple. To attach eyelashes, first check the ..
Grimas' false eyelashes have latticed lashes with blue features near the lid. To attach eyelashes, f..
A gentle and effective remover that removes individual lashes quickly and easily. .. These semi-permanent cluster lashes from Naturalash adds volume, thickens and lengthens the natural .. These individual lashes from Naturalash are salon-style, bulb-free lashes on a handy peel-off adhesi.. The 070 Strip Lash is a beautiful natural volume strip lash that instantly accentuates the natural s..
A beautiful natural volume strip lash that instantly accentuates the natural shape of your eye, addi.. This uniquely textured strip lash gives you an individual lash effect that instantly accentuates the..
A gorgeous, full-volume strip lash that instantly adds length, volume and definition. Naturalash Str.. 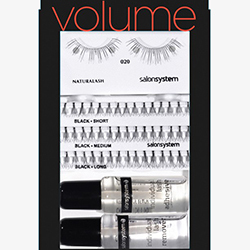 Available in three sizes-- Small, Medium or Long-- the Ultra Individual Lashes from Naturalash are m..
Made by Grimas, these black strip lashes have a criss-cross effect, making them perfect for fashion ..
Kryolan Multi-Gel is used to apply loose powders, glitter, crystals and body jewels. It can be used ..
For dramatic false eyelashes, these black tapered strip lashes from Grimas are perfect. To attach ey.. These black strip eyelashes come with feathered outer corners. To attach eyelashes, first check the ..